Alive and Young: What Would Moses Drink? Passover is only a few weeks away, and you know what that means? KOSHER COKE! That's right, once a year Coca-Cola in the United States produces Coca-Cola using real sugar, well sucrose according to the ingredient label, but the main thing is that kosher Coke isn't made with corn syrup. In other words kosher Coke is being made like regular Coke used to be made 50 years ago: it is once again the real thing and the classic it claims to be. However, not every coke in the store has been graced backed to its original recipe. You need to look for the Coke with the yellow cap that has Hebrew stamped on it in red. Though kosher Coke is for sale, it is difficult to come by, as it isn't being carried in your average grocery store -- believe me I look every year for the stuff. My neighbor, who is Jewish, was down in Baltimore doing some pre-Passover shopping at a kosher grocer. She knew that I had been looking for Coke made with sugar instead of corn syrup, so she picked me up a 2 liter of kosher coke and a couple 2 liters of kosher Pepsi (yes Pepsi is selling a kosher product too). It has been years, about 10 or so, since I last had Coke made with real sugar. 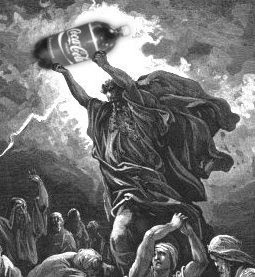 So I did a little taste test, and this is what I determined: kosher coke is smother, less bitter, more refreshing, and better tasting than the coke made with corn syrup. In short, kosher Coke is the superior product. I really don't know why coke wants to make an inferior product just so that it can save a few bucks by using corn syrup. I am completely addicted to Coke (the cola, for those who would sieze on an easy opportunity for a joke). I am now on a quest to find some "passover pop".